So, I am in the community mental health center again. Waiting room. Nick is outside, smoking, I am holding a chair to make sure he isn’t overlooked. It’s the story of my life, these days. Across the room in a corner, a father and teenage girl huddle, speaking quietly to each other. A large pile of aging fruit is by the door with a sign above: help yourself. I wonder if that refers to the fruit or the patients. A middle-aged man with a half-hearted beard sits down next to me (in Nick’s chair) but here at the mental hospital you don’t dare disrupt anyone. I can feel the glare emanating off my body imploring him to move…I’m holding a place! I have to hold a place! Nick comes in from outside, looks for a moment at me and my companion, then walks to the far end and sits near father and teenager. Beard Guy gets up to ask the lady at the window about the holiday party flyer, which for some reason has last year’s date on it. I catch Nick’s eye and say, quickly, come sit here. Beard Guy relocates across from us. He takes off his dirty tennis shoe to expose an unsocked, scary looking foot. “My foot hurts,” he announces to the room. A guy nearby asks what happened. “Oh, I hung myself four years ago. When they cut me down I smashed my foot,” he says, matter of factly. Two or three people in the waiting room nod as though this happens to everyone. “You should get a wheelchair. I’d get an electric one, with a V8 engine!” one of the nodders says, chuckling. “Do you think my doctor would let me get one?’ Beard Guy asks as though another mental patient would have the definitive word. They call Nick’s name and in we go to see the medication doctor. Are you thinking about harming yourself? Are you hearing or seeing things right now that I don’t see? Just the usual stuff our doctors ask all of us. He stares at her and then, almost unperceptively, shakes his head no. He resolutely counts from one hundred to seventy-five and then she stops him. I sit watching him out of the corner of my eye, a lump in my throat, my brain aching. He is a little boy in the school auditorium reciting his lines in the play. There is a faint furrow between his brows from concentrating. I am a young mother in a cotton dress with the future all over my smooth face. This is on the Ganges River in Varanasi, India as we set out to send prayer candles into the sea. 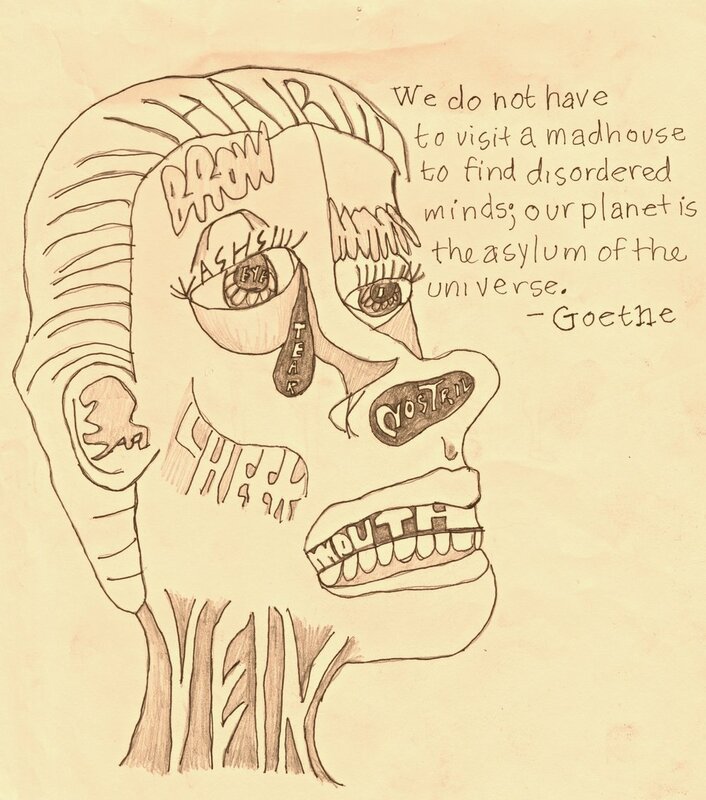 The quote in Nick's drawing seems to be a hybrid of one attributed to Albert Einstein, and another to Goethe. I am not sure which is correct. I chose it for the blog because it was so prescient, he drew the picture long before we knew what was happening quietly within him.